Turn any flat panel in every room into an elegant centerpiece that instantly improves the décor of your home. Select from fine artwork that is beautifully framed and mounted onto your TV. 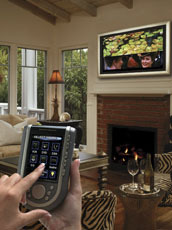 With the push of a single button, you can easily operate the motorized retracting canvas. If you like mirrors, we can integrate them directly into the LED TV for a seamless appearance. Our custom frames are designed to blend in with the décor of every room.